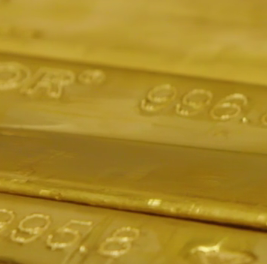 DEMAND to buy gold among private investors remains cautious despite the metal recovering from 2018's earlier drop, writes Adrian Ash at BullionVault. With the metal in November reaching its highest monthly price since the summer, private investors as a group chose to buy gold on a rising price for a second month running – the first such run since New Year 2017. 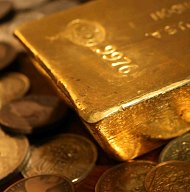 That took BullionVault clients' gold holdings up by 128 kilograms to a new record of 39.2 tonnes, worth $1.5 billion (£1.2bn, €1.3bn, ¥174bn) and securely stored in each customer's choice of London, New York, Singapore, Toronto or – most popular – Zurich. But counted by number of buyers, not weight, gold demand fell in November as prices rose. Most notably, the number of new first-time gold investors dropped to its lowest monthly total since June, retreating 31.2% from October's spike as global stock markets rallied from their worst plunge since 2012. Together that sent the Gold Investor Index to a 6-month low of 53.4 from 53.8 in October. 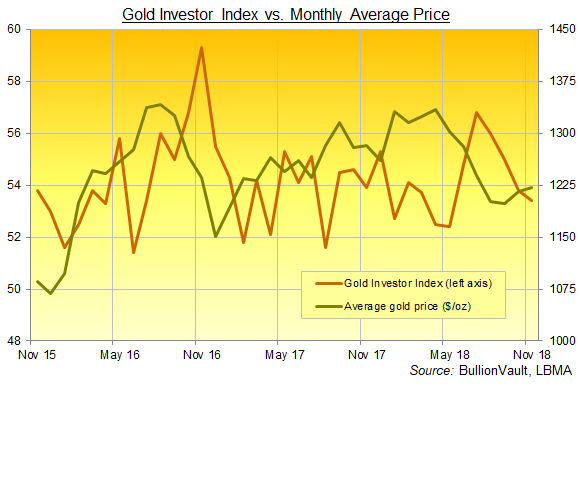 Based solely on actual trading decisions made by users of BullionVault.com and its smartphone trading apps – the largest single pool of Western private investors in physical precious metals – the Gold Investor Index would read 50.0 if there were a perfect balance between the number of buyers and sellers across the month. 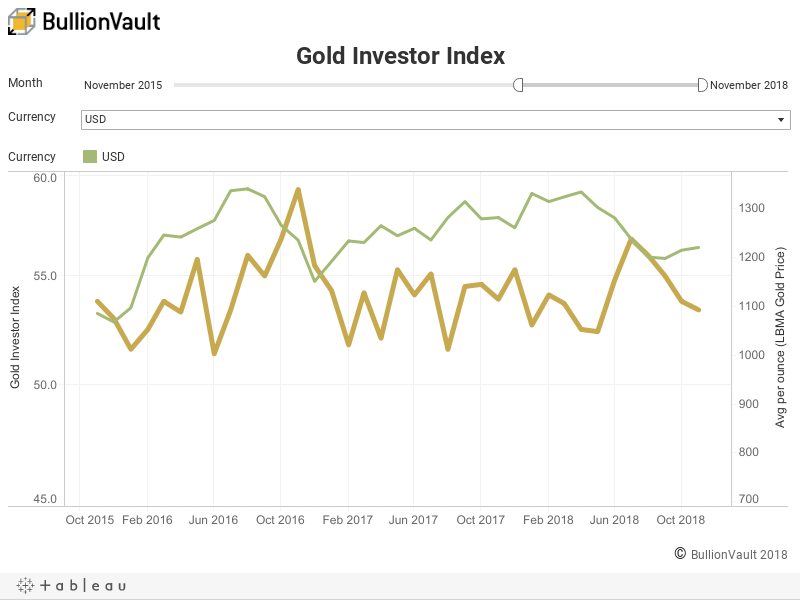 This July the index hit 56.8, its highest level since Donald Trump's election in November 2016, as BullionVault's gold market saw the fewest sellers in almost 10 years. The index bottomed at 50.5 in December 2014 as the number of gold buyers slumped by one-third from more typical levels. It recorded that same figure again the next month, January 2015, as the number of sellers leapt on a rally in prices from what were then multi-year lows. Here in 2018, gold prices averaged $1220 per ounce across November, a 4-month high in US Dollar terms, and the metal rose to a 5-month high in both Sterling and Euro terms at £946 and €1074. 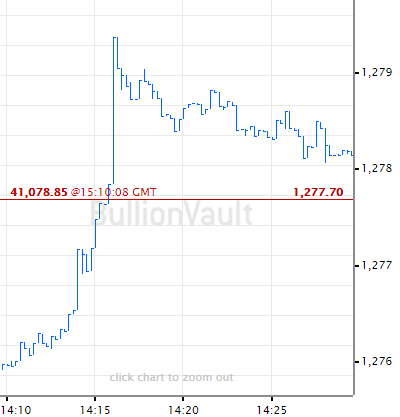 That rise in gold prices saw the number of buyers on BullionVault shrink to a 7-month low, down 17.5% from October. The number of sellers fell harder however, dropping 25.8% from October's surge to a 5-month high and marking the first time since September 2017 that the number of gold sellers didn't rise in response to a rising price. So on one side, it's little wonder gold has failed to gather much new interest in 2018. Gold prices have held flat at best this year for Western investors, while interest rates turned higher and major Western stock markets recorded or neared new all-time highs before this autumn's plunge. But on the other side, gold's performance has in fact been solid in 2018 given the lack of investor interest and the wider financial backdrop. 2019's worsening political outlook is likely to support gold prices by continuing to deter sales from existing holders. 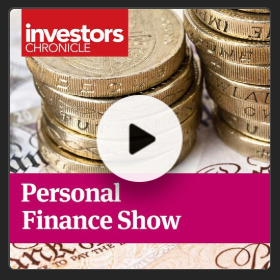 They'll want to keep spreading their risk, using to gold to insure against shocks to equities and the property market. In contrast to gold, silver prices fell in November, reversing two-thirds of October's monthly gain to average $14.37 per ounce and head for a 14.8% drop across 2018 as a whole. Yet silver trading on BullionVault saw the same pattern as gold, with the number of sellers falling harder than the number of buyers. 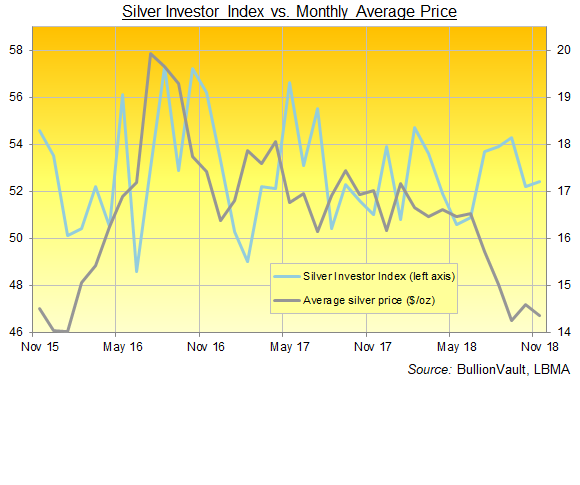 That nudged the Silver Investor Index higher from 52.2 to 52.4, in line with the sentiment measure's 12-month average. 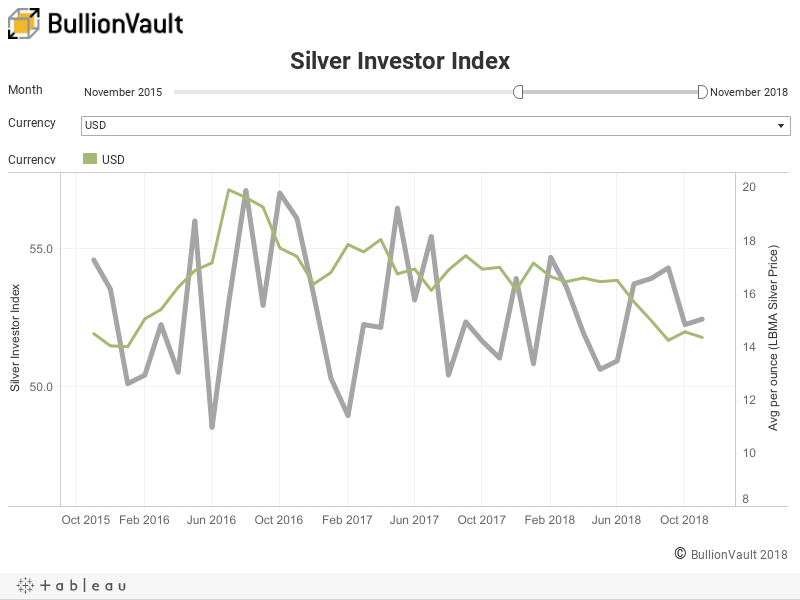 Silver investing by weight totalled 3.5 tonnes net of client selling, taking BullionVault users' total holdings up to a fresh record above 748 tonnes.